Regardless of treatment process, sludge blanket control is an important aspect of any wastewater treatment plant, and correct monitoring and treatment of sludge is paramount for efficiency and cost control. Manual monitoring of sludge blanket levels is an occasional and often rushed method of control and can lead to inaccuracies being compounded over time, potentially leading to overspill into effluent discharge channels; resulting in a costly and embarrassing situation. What is a sludge blanket? The settled layer of particles that forms at the bottom of settlement tanks is referred to as the ‘sludge blanket’, and the interface between the sludge and the water above is detected by sensors, providing a measurement of the blanket level. Too dense or thick a layer of sludge or having a very thin, poorly settled blanket can be damaging in terms of energy efficiency and environmental performance. Having sludge that is too thin makes subsequent treatment impossible or inefficient, too much sludge causes mechanical damage to scrapers and the risk of the overspill of solids. The use of efficient and accurate sludge blanket measurement equipment not only saves money by avoiding unnecessary dewatering processes but also accelerated wear and tear of settlement tank sludge pumps due to overuse. 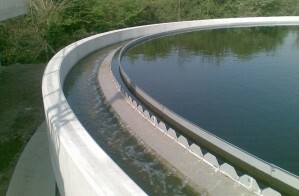 Conversely, should sludge levels get too high and overspill into effluent discharge channels due to inaccurate readings, the energy required to counteract the impact (both environmentally, mechanically and in terms of manpower) will increase a plant’s carbon footprint and act as a drain on often already strained resources – without even mentioning the PR impact of an environmental overspill. Permanently installed measurement instrumentation allows automation of sludge control, a benefit over timers and manual controls which cannot react to changes in plant loading caused by upstream process failures or weather events. Infrared ‘gap’ sensors provide a highly reliable, sensitive method of detecting the sludge/water interface and can be used to provide fixed-point alarm and/or continuous monitoring of the interface position in the tank. Fixed-point detection provides the simplest form of control, allowing the control system to activate a valve or pump to start the de-sludging process. Continuous output systems provide additional options for balancing sludge blanket levels in groups of tanks and for monitoring rates of change in the blanket level. An alternative sensing option is a lookdown ultrasonic sensor; the sludge blanket is profiled using sound reflections and a surface mounted wiper prevents air bubble disturbances and removes the need for maintenance. The use of Partech sludge blanket instrumentation can make significant process improvements at a low capital cost. Please get in touch to improve plant efficiency, save money and reduce environmental impact.